Alex Bowman picked up the 5th last-place finish of his Monster Energy NASCAR Cup Series career in Saturday’s Quaker State 400 at the Kentucky Speedway when his #88 Axalta Chevrolet fell out in a single-car crash after 108 of 267 laps. The finish, which occurred in Bowman’s 100th series start, was his first of the season and first in the Cup Series since July 26, 2015 at Indianapolis, 107 races ago. In the Cup Series last-place rankings, it’s the 29th for car #88, the 568th because of a crash, and the 749th for Chevrolet. Across NASCAR’s top three series, it’s the 55th for the #88, the 1,151st from a crash, and the 1,611th for Chevrolet. Coming into Kentucky, Bowman had earned three-straight top-ten finishes: a 9th at the Sonoma Raceway (where he also qualified 7th for the K&N Pro Series West race in a car that broke the internet), a 10th at Chicagoland, and another 10th at Daytona. The crash-marred Daytona finish was particularly impressive. 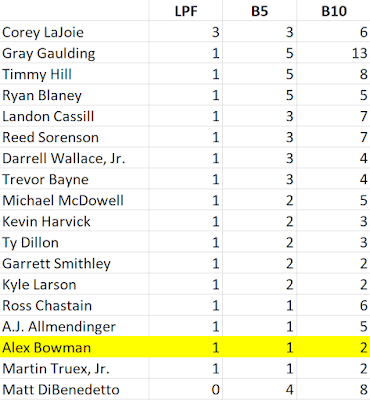 On a night where literally half the field was eliminated in wrecks, Bowman skillfully saved his car from a late-race spin and came out as the only full-time Cup driver to finish every points race under power (his last-place run in the All-Star Race didn’t count for points). 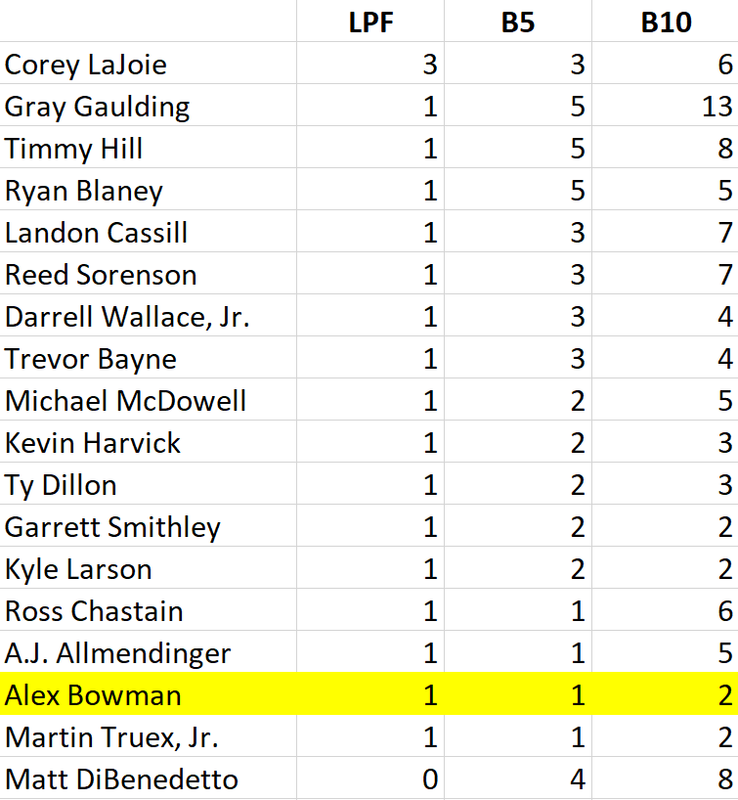 Thanks to this consistency, “The Showman” held fast to the 16th and final spot in the Playoff standings, 19 points ahead of Ricky Stenhouse, Jr.
Kentucky was another track where Bowman hadn’t raced Cup in several years. His only two previous starts were a 36th for BK Racing in 2014 and a 31st for Tommy Baldwin Racing. Both times, however, he’d finished under power and even led two laps in the race with Baldwin. He’d also finished 5th in his most recent XFINITY start there in 2013. At the track, Bowman started the weekend 22nd in the first practice and 28th in Happy Hour. After running 13th in Round 1 of qualifying, he qualified 15th overall with a lap of 186.625mph (28.935 seconds), missing the cut for Round 3 by just over a tenth of a second. Starting last in Saturday’s race was Timmy Hill, lowest-ranked of the four cars who weren’t able to pass inspection in time to turn a lap in Round 1. Hill’s black-and-blue #66 Crypto Crow Toyota was one of three cars in the field backed by a cryptocurrency firm, joining Kasey Kahne’s #95 Chevrolet with Dark Matter Presented by Ionomy and Corey LaJoie’s #72 Monarch Chevrolet. The other drivers who failed to turn a lap in Round 1 were Denny Hamlin, who failed inspection twice, plus Matt DiBenedetto and Jesse Little. Little, a part-time Truck Series competitor and son of Cup veteran Chad Little, was making his Cup debut for Premium Motorsports in an unsponsored #7 Chevrolet. With 39 drivers for 40 spots, no cars were sent home after qualifying. Prior to the race, just one driver was sent to the back of the field. 18th-place starter Kyle Larson missed driver introductions because, as NBC Sports reported, he thought he had more time to hang out with his friends before the race. Larson didn’t spend much time at the back, ultimately charging to 9th at the finish despite a persistent problem with the electronic track bar adjuster. When the race started, Hill’s #66 followed the field into Turn 1 and got a good run to the inside of Little, dropping the #7 to the back of the field. Hill then caught B.J. McLeod on the backstretch, and by Turn 3 dropped McLeod’s #51 Prefund Capital Chevrolet to the 39th spot. McLeod then caught Hill for position on Lap 6, and made it by him by the 11th circuit. Hill was still in the last spot when Landon Cassill pitted his #00 StarCom Fiber Chevrolet for a vibration caused by a loose left-rear wheel. The green-flag stop made Cassill the first to lose a lap to the leaders, ultimately losing two by the time he rejoined the race. When Stage 2 began on Lap 88, Timmy Hill was again in the 39th spot, followed on Lap 101 by Cassill’s teammate Garrett Smithley, back in action in the StarCom Racing #99 Victory Lane Quick Oil Change Chevrolet that trailed the Michigan race in June. Smithley, who slipped into the Bottom Five when Little held last, worked his way past Hill by Lap 106. From there, Hill was still running in the last spot until the night’s second caution came out on Lap 110. At that moment, Alex Bowman was following Denny Hamlin into Turn 3. He was running mid-pack, having led Lap 63 during an exchange of green-flag stops. Suddenly, his Chevrolet erupted in sparks from an apparent flat right-front tire. The car then steered into the Turn 3 wall, flattening the passenger side. Bowman managed to get his car back to pit road, but the crew quickly decided to take him back to the garage, done for the night. 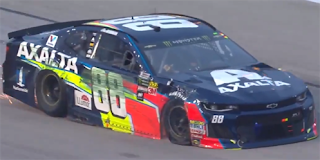 As driver and crew talked over what happened, Bowman said the car was getting tight, but he didn’t run over anything, and wasn’t sure if it was a tire or a brake rotor that failed. He also had to pump the brakes during the race, and had lost them entirely as he rolled into the garage on Lap 112. He secured last place from Timmy Hill on Lap 115. With both Bowman and Stenhouse struggling on Saturday, Bowman remaons 16th in the Playoff standings, now just 9 points ahead of Stenhouse. Finishing 38th was J.J. Yeley, whose second-straight run in the #23 Steakhouse Elite Toyota ended with an engine failure in Turns 3 and 4. Yeley managed to slow his car enough to avoid contact with the outside wall. As of this writing, the BK Racing team is awaiting a hearing on August 21 where the team and its Charter will be sold to a new owner, pending NASCAR’s approval of the sale. The 37th spot fell to Matt DiBenedetto, one of many drivers who struggled with mechanical issues in the race. DiBenedetto took at least one trip to the garage to replace brake rotors before ultimately pulling out of the race in the final laps. Smithley finished 36th, the final car to run under power, followed by Little in 35th to round out the Bottom Five. *This marked the first last-place finish for both Bowman and the #88 in a Cup Series race at Kentucky. *This was the first last-place finish for Hendrick Motorsports since Dale Earnhardt, Jr. lost the engine at Watkins Glen last year, and the second in a row in this race following Jimmie Johnson’s run last year.